I got the Kindle version of this book for free a few months ago. It's divided broadly into two sections, the first dealing with the techniques of criminal detection, with specific reference to "cold cases" — unsolved crimes (usually murders) where the original witnesses are no longer available, although there is documentary evidence of what they said during the original investigation. 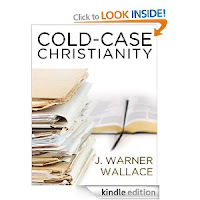 Wallace draws parallels between these cold cases and the claims of Christianity where, likewise, the original witnesses to the life of Jesus are no longer available, although there is documentary evidence of what they saw and heard. This is fine as far as it goes, but there is a glaring mismatch in the kind of evidence we should be looking for. Murders are commonplace; resurrections are not. So although being convinced "beyond reasonable doubt" ought to be as sufficient to draw an inference regarding a resurrection as it is regarding a murder, the real question is what counts as "reasonable" in either scenario. The kind of evidence it is reasonable to expect for an event as extraordinary as a resurrection, is a different order of extraordinariness from that for a commonplace murder. From that perspective it appears Wallace is presenting a false equivalence. It seems sensible enough, however, to use skills honed in the investigation of cold cases and apply them to the historicity of the New Testament, even if the subjects of investigation are not directly equivalent. But there's a nagging doubt that irked me throughout Wallace's anecdotes about cases he's worked: he appears certain that his techniques always produced a correct result — that he always got his man. I can recall no anecdotes in the book about cases where the defence was successful — where the accused was found not guilty. Presumably such cases exist (unless Wallace's skills are 100 per cent "successful"); it would have been interesting to read Wallace's interpretation of why he failed to secure a conviction. Perhaps he would say that the jury got it wrong. This is an important consideration, given that at the beginning of the book he makes much of the investigator's presuppositions and how they can influence the interpretation of evidence. The presupposition Wallace seems most concerned about when considering evidence for the historicity of Jesus is the skeptic's alleged presupposition against supernaturalism. This concern is often expressed by religious apologists, and one can understand why, but here it appears a bit incongruous. Did Wallace have a presupposition against supernaturalism when working his cold case murders? If not, I'd like to know how he would deal with supernatural claims in witness statements. It's possible — even probable — that no witnesses ever made supernatural claims, so perhaps the question would not have arisen. There's a reason such a question is likely not to have arisen, and that's because we do not see credible supernatural occurrences in the modern age. Ancient literature may report magical occurrences as if they are all in a day's work. These days, however, not so much. The vast majority of reported modern miracles, when properly investigated, turn out to be not supernatural. It is therefore entirely reasonable to presuppose that supernatural events reported in ancient literature were not, in fact, supernatural. With regard to the motivations of the apostles, martyred for their beliefs, we must consider the possibility of self-delusion and hysteria. We know from modern studies of cults (religious and otherwise) that group dynamics and psychology can make people behave in very strange ways, including changing their beliefs. This could easily result in a kind of mass delusion about what really happened after the crucifixion. And even if some accounts were written down as early as a mere five years later as Wallace suggests, that's still plenty of time for memory to play some very cruel tricks. Some skeptics contend that the disciples engaged in a conspiracy regarding the resurrection of Jesus. Wallace devotes several pages to the infeasibility of large scale conspiracies without mentioning one obvious fact: large scale conspiracies always fail, except for the successful ones. But it's the successful ones we never hear about. The second half of the book is an examination of the New Testament text, in an effort to show that as a collection of reports of what actually happened it is reliable, despite apparent contradictions, omissions and barely credible occurrences. This is necessarily compressed, presumably to fit some deep study into a limited word-count, but the compression contributes to a certain air of desperation exhibited in this section of the book. Wallace makes much of the correlations and consistency between various copies of the original autographs, claiming that these show that we can be reasonably sure what those autographs actually said. But as far as I'm aware the copies do not state what generation they are. Even if there are thousands of early copies that say the same thing, we cannot know whether or not they all derive from a very few (now lost) first or second generation copies that all contained the same errors or distortions. J. Warner Wallace was the guest on Unbelievable? yesterday, answering questions from two skeptics. Having made a special effort to finish the book before listening to the programme, I didn't really gain anything extra from hearing the author précis his case, so the programme was a bit disappointing. I remain skeptical of the claims of the New Testament, and continue my presupposition against supernaturalism. Labels: Christianity, crime, detective, J. Warner Wallace, Jesus, Kindle, New Testament, Premier Christian Radio, Unbelievable?